PamKittyMorning: All People Quilt Along! Falling on the heels of that completed pillow you'll be shocked to see I actually have a start on my quilt along quilt. 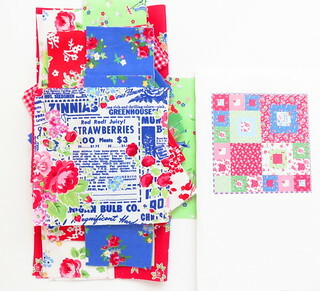 I've chosen the quilt from Quilts and More Magazine, Step by Step. True confession, I just don't think I have it in me to patiently cut strips for that string quilt, even though I think it's tons of fun. Of course I have to make things Pam Kitty Style, and to do that I needed to look at the size of the pieces and the scale of my fabric. The magazine version uses large scale prints with a modern look, and my fabrics are smaller scale, so I got out my calculator and got busy cutting the pattern down to size. Then I popped the design into Photoshop and got busy with a layout. You can see my printout as a guide next to my stack of fabrics. My quilt will be half sized, and will be perfect for the top of a table. 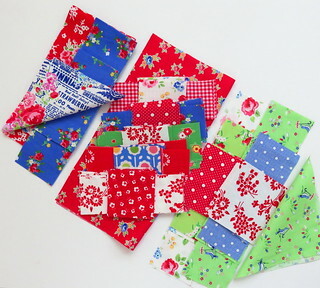 As a bonus, easy to quilt. I used the layout of the fabrics in the original quilt to guide me in fabric selection and placement, and I had a lot of fun going through all my boxes of fabric to find fabrics to use from all my collections. It really is a perfect stash quilt. If you're stitching along with all of us I hope you'll show off your progress on Instagram and on Facebook using the hashtag #APQquiltalong so we can look around and see what everyone is working on. Thanks for stopping by. You guys are the best.